Fred Pascoe’s family goes back a fair way in the Gulf, possibly about 40,000 years. His family didn’t meet a “whitefella” until 1904. That was his great-great grandfather, “Kangaroo”. In Fred’s words a “lusty” fellow who had seven wives. Fred jokes with a smirk that unfortunately that part of the family genes did not flow down. Fred’s great-grandfather started working the cattle that have been a fixture of the Gulf ever since. His love of the country was too strong for the city. He died six days after moving to town in retirement. Now Fred manages his own cattle property. Cattle have given Fred and his family a additional connection to his country. Cattle are now part of their culture. Cattle are part of the nation’s culture too. The economy of the north depends on cattle. The truck drivers depend on them, the stock and station agents depend on them and even the local show and rodeo would not exist without them. That’s what makes the government’s bungling of the live cattle saga a few years ago so galling. It was an attack on a culture. A culture that has been built up over more than 100 years, and now threatened by a combination of government incompetence, the roaring of money printing presses in other countries and the failure of monsoonal rains. We can’t do much about that rain. I will leave that one to the local graziers and their God. We can, however, stop making bad policy decisions and start a debate about the high Australian dollar. When we shut down the live cattle trade, we affect the food supply to a nation of more than 250 million people next door. Because of the undisputed barbaric acts of a small number of people in a very large industry we impugned an entire nation’s culture. The message was implicit but clear: we don’t trust you enough to provide you with food anymore. Our government engaged in a prejudicial policy condemning the many based on the actions of a few. Since then the Government has made little attempt to support our own domestic cattle industry or make amends with our largest neighbour. Because governments caused these problems, there is a moral obligation on them to help solve these problems. On Tuesday, I attended a beef crisis forum in Richmond. In a town of only 500 people in the Gulf, a crowd of 500 turned up, in a mood, not to vent frustrations, but to propose solutions and to look for leadership. One of those solutions was for the government to purchase 100,000 head of cattle to put an immediate floor price in the market. Because the live cattle trade fiasco has dropped demand by about 300,000 head of cattle a year, beef prices are plummeting. 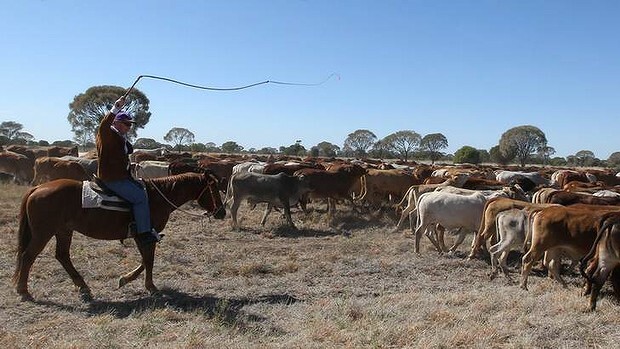 In Longreach, cattle sold for $20 per head last week. That’s the equivalent of buying your scotch fillet for 10 ¢ a kilogram. But the price of the dollar means our beef is still expensive to those overseas. More than 30 foreign central banks now hold Australian dollars, along with Google, Apple and Berkshire Hathaway. The Botswana central bank is not diversifying into the Australian dollar because they share our love of a sunburnt country and wide, open plains, but because we are becoming a “safe haven” currency. Our exporters are paying their insurance policy. Our terms of trade have fallen by 15 per cent, and economic growth is being downgraded. Still, our dollar remains relatively high. The Reserve Bank recognised this on Tuesday by cutting interest rates, in part aimed at the high dollar. The Australian dollar is not a sacred cow. The RBA has clearly announced that its monetary policy is now looking to target the dollar, and we have intervened directly in foreign exchange markets on 35 separate times in the past 24 years, including eight times since 1997. Other nations are not as restrained as we are. The United States is now delivering quantitative easing at a rate of $85 billion a month. The Swiss have imposed a ceiling on their currency, and the new Shinzo Abe government in Japan is actively adopting policies to devalue its currency, by 20 per cent since last December. Meanwhile, we are keeping our innocence and making life near impossible for those who we are relying on to figure ourselves out of our current financial mess. What’s the good of being pure, if you end up broke? It’s wonderful – if all too belated – to finally see a politician from one of the so-called “major” parties speaking truthfully about the AUD exchange rate, and the close-mindedness on the part of our economic mandarins which has caused so much damage to Australian businesses (and thus, the economy) over the past couple of years.